Just in case you couldn't make it to the IEG Conference in Chicago, we've culled the twitterverse to find the most interesting insights from an enthusiastic band of sponsorship tweeps in attendance. It will be updated through Wednesday so check back periodically. (Note: Twitter is a short form communication platform so grammar/abbreviations may reflect that). Knoepke_IEG: Patrick Pierce, Allstate, on shift to metrics-driven activation: "How the heck did a halftime kick promotion sell insurance?" 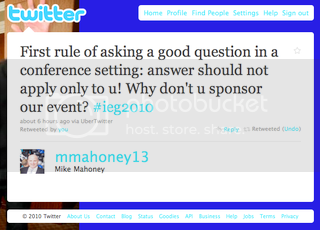 MMahoney13: After sponsorship spend fell in 2009, IEG projects 4pct increase to 17billion in total spend. Cause mktg to grow most. MMahoney13: ATT has 3 agencies of record, Velocity, Career Sports and The Marketing Arm, spreading it around. RethinkTweet: Has sponsorship become unbound? Are the rules different or is the core still the same? jenniscribe: CEO AAA M/A partnered w/ Dover Speedway just b/c he liked the org people. It pays to be approachable & personable. SportsMarkGuy: Bob Stohrer,Virgin Mobile: Consumers want to be arm chair activists. Spend little time and energy, but feel involved, give back. MMahoney13: Unlock expressions, not impressions. Sponsorship shouldn't compete w/ ads 4 eyeballs but entertain, interact. SportsMarkGuy: Activation budgets should still be at least 50% of the price of the sponsorship.That # will increase in near future (need for ROI). SportsMarkGuy: Curation-Consumers want companies to create, not interupt or clutter. Companies need to activate outside their brand sale. SportsMarkGuy: Passions is the biz we're in. This never changes. Create platforms for continuous conversation. 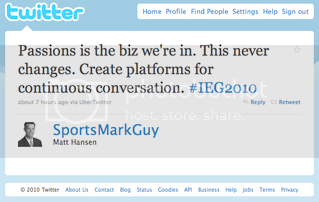 SportsMarkGuy: What u will hear at every #IEG2010 session: Cause, Engage, Value, Measurable, Credible, Authentic. MMahoney13: Red Bull spends 2x rights fees on activation. Quiktrip about 1 to 1. MMahoney13: Sponsorship and Advertising are different to consumers. Sponsorship takes longer to impact behavior but decay much slower. SportsMarkGuy: You don't measure sponsorship, you measure activation. SportsMarkGuy: Once u find your customer's passion points, think ART... Authentic. Relevant. Transparent. SportsMarkGuy: Dan Schorr, start2finish marketing: bring your brand into the home. Why? Staying in is the new going out. Knoepke_IEG: Dawna Stone (@WomensHalf): "Ask for what you know you deserve. Bring your passion w/ you." MMahoney13: Intersport Taco Bell "steal a base, steal a taco". Multi-channel, great bdcst integration by Fox. Highest sales day in T.B. yr.
SportsMarkGuy: 50 percent of sponsors say ROI has increased over past few years. 23 percent still don't know. Thanks to everyone for sharing their coverage. Did we miss something good? What are your thoughts on the conference? Feel free to drop a comment and let us know!